Most of you may not know this, but on top of my intense knitting schedule I also have quite the full sewing schedule too. I think I may have bitten off way more than I can chew, and it's all starting to overwhelm and exhaust me. I'm crafting on auto pilot here! The scary part? The gift knitting hasn't even started yet. I have to thank my lucky stars that I don't have much to do for gift knitting...just the sweater for Brett and some small, quick-knit accessories. Phew! The sewing, on the other hand...well...that's a different story. I've been trying to squeeze in as much sewing time as I possibly can in the non-existent extremely limited sewing time that I have. What's the deal, you ask? I'm trying to build up enough stock for my shop for the holidays. So what does that entail for me? Well, now that the Munchkin no longer takes naps (and this is so beyond sad for me) I stay up until 3am prepping (ironing and cutting fabrics) in between knitting rounds, then waking up early in the morning hoping that I can sew for at least half an hour before Brett has to go to work. Sometimes I can get a seam or two sewn while the Munchkin is off in his own little world but really, during the day I'm trying to keep on top of the housework, play time, and all the things that involve being a mom. But I think I need to take a break. When you're trying to squeeze in this much crafting in such limited time, some things are bound to slip through the cracks. Small things, like remembering to sew in a pull-tab. Then realizing this little error when the bag is finished. I'm not willing to stop and rip the whole bag apart just to add the tab. I need to keep going forward. What else can one do while crafting on auto pilot? Oh, and what about forgetting to put away the much disliked so-called "medium weight" fusing, which you end up using in not just one, but two bags. I remembered while sewing the two bags that they felt much lighter and looked a little too flimsy for my liking but thought that I was just overly tired was imagining it all. Sewist's denial? Maybe. Then as I finished up the second bag the gut feeling that was eating away at me had its last chomp and that's when I realized that in fact I did use the wrong fusing. You can't tell by looking at it (it's the Harajuku Fun bag), but you can definitely feel the difference. There's absolutely nothing wrong with the construction of the bag. It just doesn't meet my standards. I'm thinking maybe I should open a sale section in my shop to sell the "as is" bags...the ones that don't meet my expectations. The ones that may have a pucker in a seam (yuck! ), the ones that may be made with a weird colour/fabric combination (was I that tired when I pulled those fabrics together?? ), and the ones that may have a slight fabric flaw (how could I not see that weird line running through that print??). What do you guys think? Yay? Or nay? Über bad idea? Obviously these bags would be sold at a discount. I wouldn't want to pay full price, why would I expect anyone else to? Well, while I ponder what to do with my less than perfect bags (after all, I can't keep them all to myself! ), I'm going to do a quick giveaway! 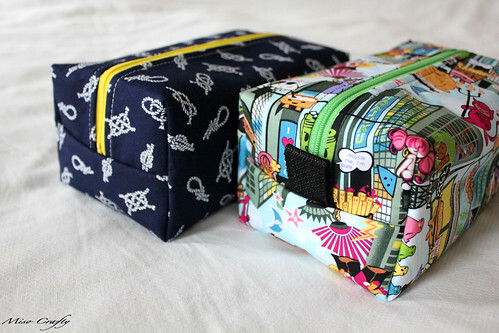 Since I made two Harajuku Fun bags with the lighter fusing, I'm going to give one of them away. Please note: the bag is in perfectly good, working condition with nothing visually wrong with it, it is in fact, below my shop standards. I don't want the winner to get the bag and be completely disappointed that the bag can't keep its boxy shape cause it's so smushy. If you think you can handle that and want a chance to win the bag, keep reading on! The giveaway is open until Friday November 4, 2011 at 12 midnight PST (I told you this was going to be a quick one!). I'll use the random number generator to pick a winner (if anyone enters, that is!) and will be contacting the winner sometime over the weekend. To enter, all you have to do is leave a comment telling me if having a sale section for the one-offs is a good idea or not and why. Coolio? Ok. I should go throw some ingredients into the crock pot and get cracking on some knitting. Good luck! i think the sale thing could be a good idea. everybody does it. i totally understand the "it's not perfect" point of view, being an anally meticulous crafter myself (or at least picturing myself as one), but i don't think most people would mind a missing pull-tag or something. at least you could give it a try and see how it goes! I think it's a great idea to sell the 'as is' items. Your buyers would probably appreciate knowing what the 'flaw' is but as they probably function as well as your shop standard, they're still completely functional for the intended use. I'd love to win one of them BTW. I'm a regular reader of your blog and I like seeing all the crafty things you make. Keep up the good work! Love that fabric! I say selling the "not-up-to-snuff" bags is totally fine. I feel your pain on the holiday knitting rush. I got smart this year and did my Christmas knitting in June so I can knit for myself now. i would totally do a sale on your one-of items! as for holiday knitting, we can have a heart attack together.. seriously. why doesn't november have 60 days? hahahah. also, i like those bags :) they're nifty. I would so buy a not standard bag!!!! Nothing like a giveaway post to get the lurkers out of the woodwork! 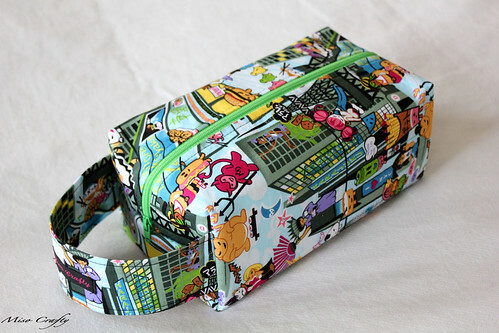 I love your project bags - they're the perfect size, and you always have such cute fabric. I think a sale section is a good idea, but I would definitely think about putting restrictions on it. I worked for a company that was extremely fussy about packaging, and crooked labels, uneven fills and any kind of package defect was just not acceptable to the owner. She made as-is items generally available to employees/people she knew at a discounted rate, but offered only occasional sales (2-3 times a year) where general customers had the chance to buy the as-is items. She felt that this policy of restricting the availability of as-is items maintained her reputation as a high-quality and high-standards manufacturer. It also meant that the as-is item sales became a bit of an event, and they sold quite quickly, thus freeing up time to handle the sales of 'regular' merchandise (with their higher profit margin) the rest of the time. I think an "as-is" section would be fine...it's just the same as when you buy a "knotty" skein from a dyer -- a small defect that a knowledgeable purchaser doesn't mind, especially if the deal is sweet. In fact, I get pretty stoked when that not-quite-perfect skein is there for me to purchase because mo' money= mo' yarn. I think an "as is" section is a great idea provided you list exactly why it isn't up to your standards, honesty is the best policy. That being said, as a college student I can't always afford really nice well designed and crafted things so having the opportunity to buy something at a discount that I love would be awesome. Especially since I wouldn't mind not having a tab or a small pucker given I can't sew half as well as you can. I must say that your "not up to standards" bags are still beautiful! I totally think an "as is" section is a good idea. I would hate to see all that effort and material wasted, even if it isn't to your standard. I suggest that you include a disclaimer with whatever you post in that section, that way potential buyers know why the item is in that section. BTW you're a super momma/crafter! Don't forget to take some time for yourself if you get the chance. THIS IS ME ENTERING! 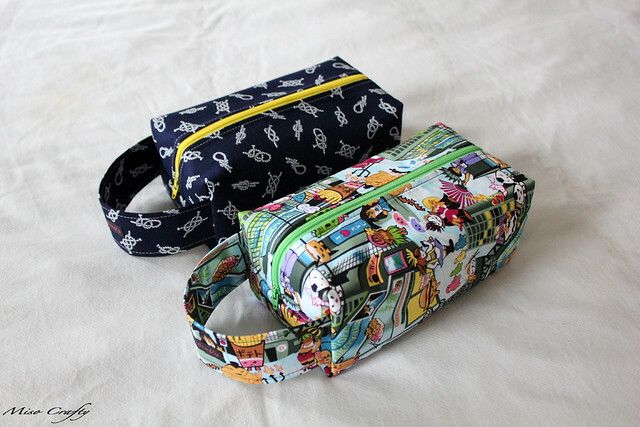 I LOVE YOUR HARAJUKU FUN BAGS!!! As tough as it is to find time and it can be overwhelming, remember to stop and enjoy the fact that you are so in demand! We love MisoCrafty! For sure you should sell your 'not so perfect' project bags at a discount. You have invested time and money. I'm a big fan of your knitting. I can't believe how fast you knit. Also I'm a big Oso fan! Yup I was born in Nelson too - in fact I still live there! Keep on knitting but try to get some sleep!